JAGA is captured by NEMEX, the Astral Imprisoner. Only LION-O can save him. He enlists the NETHERWITCH to transport him to the Astral World. 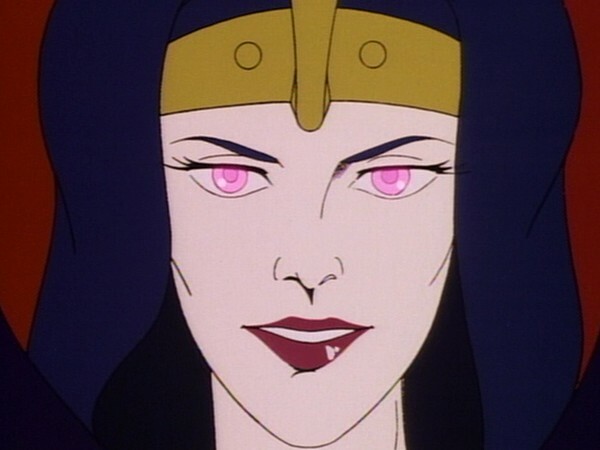 Unknown to him, the NETHERWITCH is another manifestation of MUMM-RA. Having trapped LION-O in the Astral World, MUMM-RA encourages the MUTANTS to attack the Cats’ Lair, using VULTUREMAN’s Thundranium Cannon. LION-O succeeds in rescuing JAGA from NEMEX. 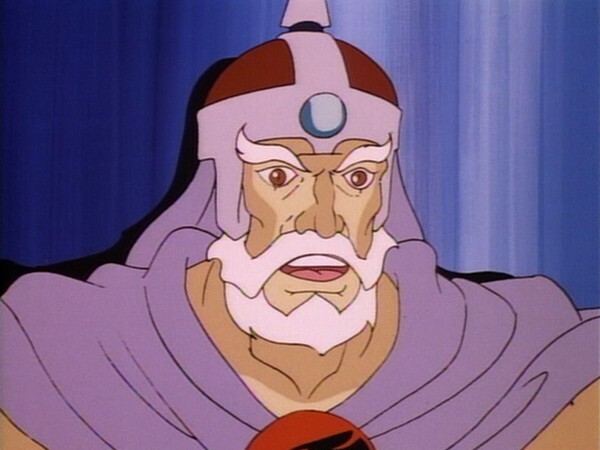 At the same time, he frees BRODO, an ancient wizard and long-time enemy of MUMM-RA. 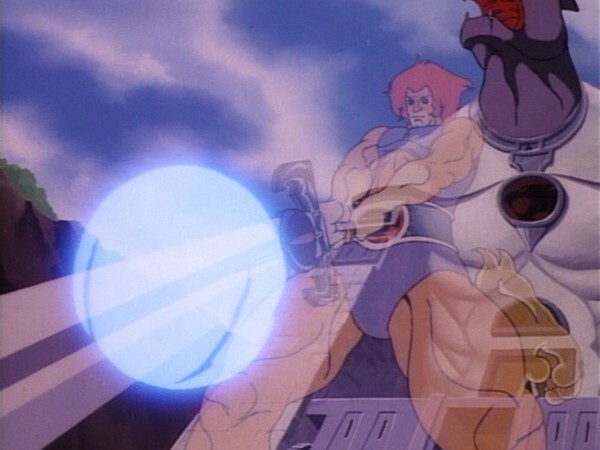 BRODO is able to return LION-O to Third Earth in time to destroy the Thundranium Cannon, rally the THUNDERCATS and defeat the MUTANTS. Lion-O displays great bravery and inner strength in confronting the unknown. He is willing to take the risks demanded for the sake of rescuing Jaga, who in captivity in the Astral World is resisting the efforts of Nemex to deprive him of his knowledge and autonomy. Lion-O enters into the world of the spirit where things are less tangible to him than matter. For us, it sometimes takes great courage to enter into our own inner world of feelings and emotions when we encounter our wishes and fears. Often these are unknown and unclear to us. Only when we acknowledge this feeling side of ourselves can we integrate the wishes and fears into our lives. If we do not face them, we run the risk of being in conflict with ourselves and, like Jaga in captivity, of losing our self-determination by being dominated by our inner impulses. Acknowledging our emotions allows us to integrate them into our lives and be in control of our feelings and actions. A second lesson that is revealed in this episode involves reciprocity in giving to and taking from others. Lion-O is led to the choice of helping Jaga because of the gratitude he feels as a consequence of all he has been given by Jaga. 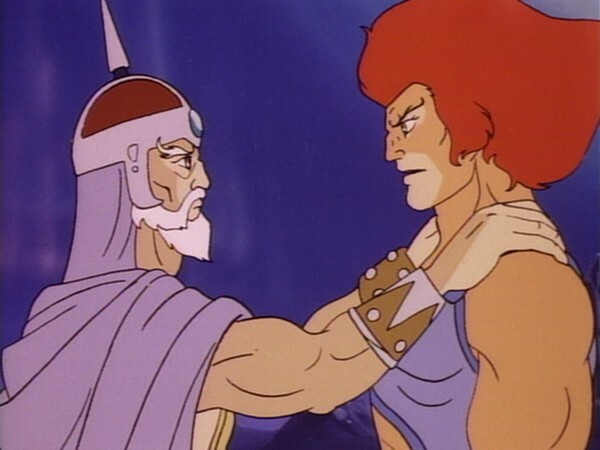 And Brodo, who owes his freedom to Lion-O, compensates him by returning him to Third Earth. We should be aware of those who have given to us and be prepared to give back to them and acknowledge our gratitude. From the very first appearance of Lion-O in “Exodus”, it’s established that there is a very special, father-and-son relationship between him and Jaga. Although the background for it is never explored in any great detail. However it developed, the relationship between these two characters would be one of the most touched upon and memorable of the entire ThunderCats series, and as such, it was only a matter of time before an episode like “The Astral Prison” came into being. 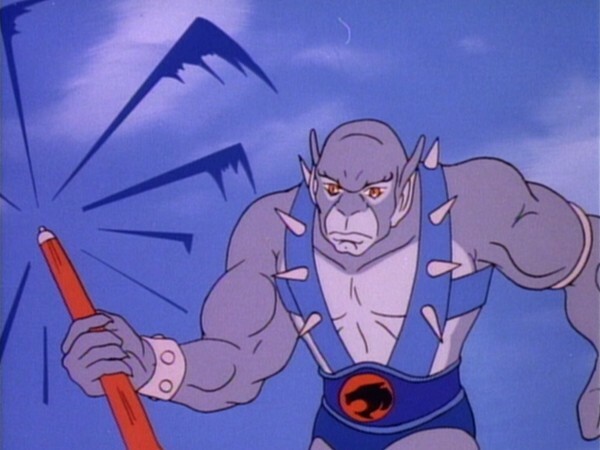 Arguably one of the most heart-wrenching, memorable and perhaps even shocking moments of the ThunderCats series is when Jaga dies. Although tastefully handled, Jaga’s death is nonetheless powerful and moving. 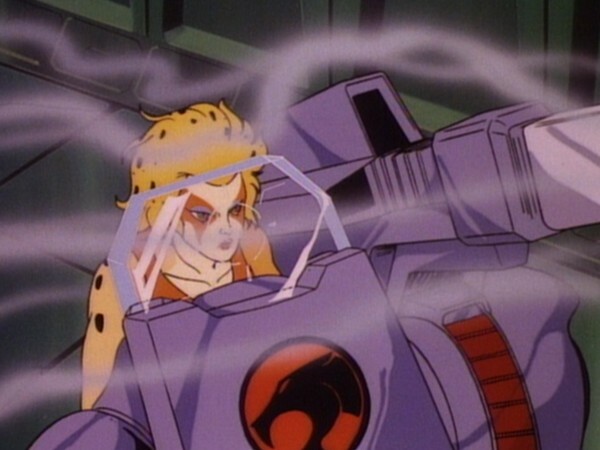 Part of what makes it so palatable is seeing the spirit form of Jaga return almost immediately as a mentor and guide to Lion-O, thus showing that, in the ThunderCats universe, death is merely a case of passing from one plain of existence to another, rather than simply blinking out of existence. Obviously this train of thought owes a lot to a variety of different religious beliefs, but also serves a valuable story function, by providing Lion-O with his own, personal mentor who speaks always directly to him, thus allowing for a lot of Lion-O’s character development within the series. 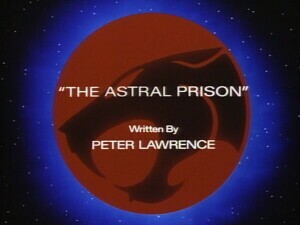 One of the things that makes “The Astral Prison” such a memorable episode is that, in many ways, it basically explores the ThunderCats universe’s concept of the afterlife, showing it as a plain of existence that it is possible for a mortal being such as Lion-O to journey to and interact with. 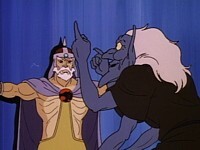 Whilst the predictable thing would have been for Jaga’s captivity in the Astral World to be a scheme of Mumm-Ra’s, in order to permanently separate Lion-O (and thus the Sword of Omens) from the ThunderCats forever, instead Mumm-Ra merely seizing the opportunity that Jaga’s capture presents. This makes the storyline somewhat more original and, arguably, credible. 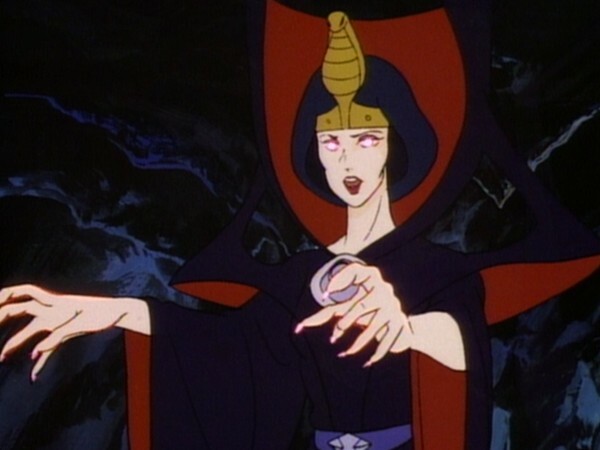 Despite the opportunism, this is a very powerful episode for Mumm-Ra. Indeed, it comprehensively displays what a far-reaching force he is and has been on Third Earth. 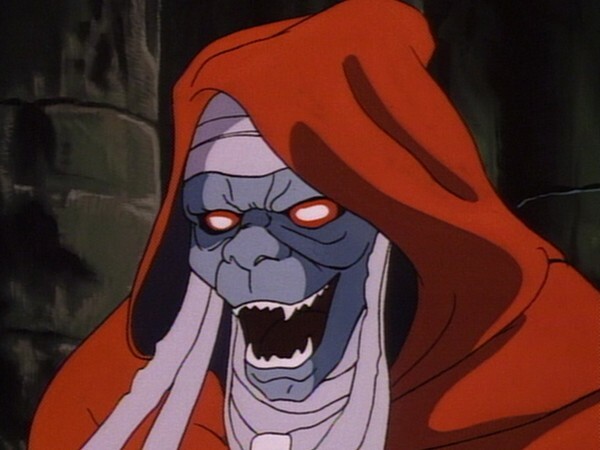 That his guise as the Netherwitch should be almost as well known (and perhaps, prior to the ThunderCats’ arrival on Third Earth, even better known) than Mumm-Ra himself shows just how much his evil influence has been a part of life on Third Earth for a long period of time. This is further established when we are introduced to Brodo, a being banished by Mumm-Ra to the Astral World for being a threat to his power. These banishments—first Brodo and now Lion-O—demonstrate just how powerful Mumm-Ra really is, as transporting his enemies to the Astral World is equivalent to sending them directly to afterlife! That Lion-O should be so willing to effectively make a deal with the devil and embark on a one-way journey to the afterlife shows just how deep-seated the bond between the young lord and his mentor is, and also, perhaps, how much Lion-O has come to rely on the advice of Jaga in order to carry out his role as Lord of the ThunderCats. The Astral World is actually quite straightforward, and in many ways it’s a shame that we are only shown such a small part of it. Given that it appears that those who reside there live in structures reminiscent of houses or other buildings (at least as is evidenced by the existence of a prison building), it would have been enjoyable to see where Jaga resided, as well as other areas of the Astral World beside just the prison and the area surrounding it. However, in reality this would have taken screen time away from other important aspects of this episode. The sub-plot regarding Vultureman’s Thundranium Cannon is a slightly predictable one, and yet is highly necessary to add a sense of drama to Lion-O’s absence. However, despite the slightly predictable nature of the danger presented by Vultureman’s invention and the Mutants’ assault on Cats’ Lair, the whole sequence is handled extremely well and with a real sense of threat present throughout, showing that, despite his youth and relative inexperience, Lion-O’s leadership and abilities really are a central component in the ThunderCats’ survival. Visually, this episode is beautifully animated. Although there is not much cel shading (which is to say, the artwork of the main characters tends to be colored with solid colors rather than with areas of brightness and shadow being added), the actual renderings of the characters and the fluidity of their movements is a joy to behold, greatly adding to the overall enjoyment of this already highly entertaining episode. I make no secret of the fact that “The Astral Prison” is a favorite episode of mine, for many reasons. As well as exploring (at least superficially) the relationship between Lion-O and Jaga, it also features great action, great drama, and a variety of highly memorable scenes. Like many of these early episodes, “The Astral Prison” is a classic and one that no ThunderCats fan should go without seeing. 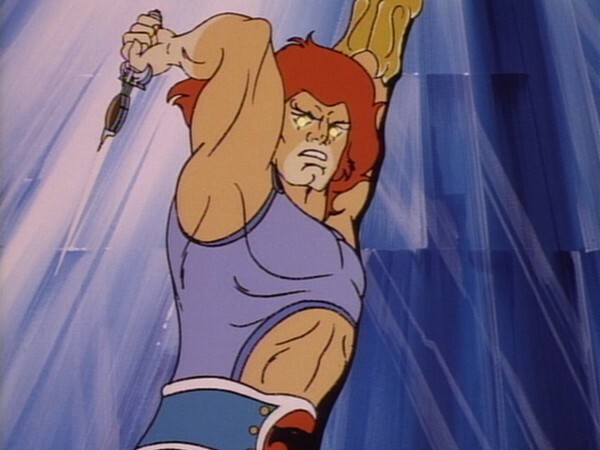 The original script for this episode states that Lion-O opens the door to the Sword Chamber by secret panel, and refers the animators to the episode “Pumm-Ra”, which shows Mumm-Ra opening the Sword Chamber in this way! 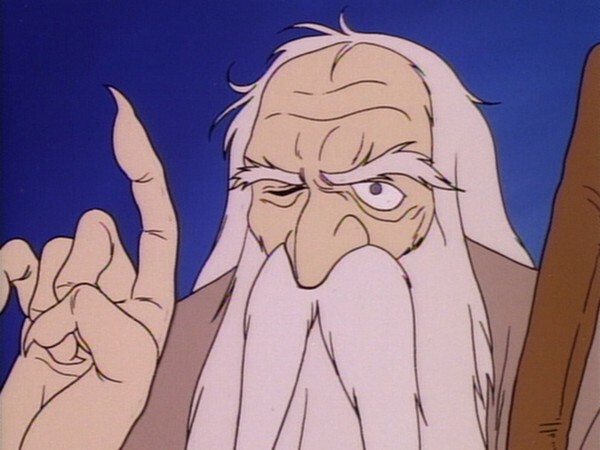 The script for this episode provides a character description for Nemex that differs radically from the version shown in the completed episode, describing him as being ghost-like, “faintly translucent”, and wearing a cloak. 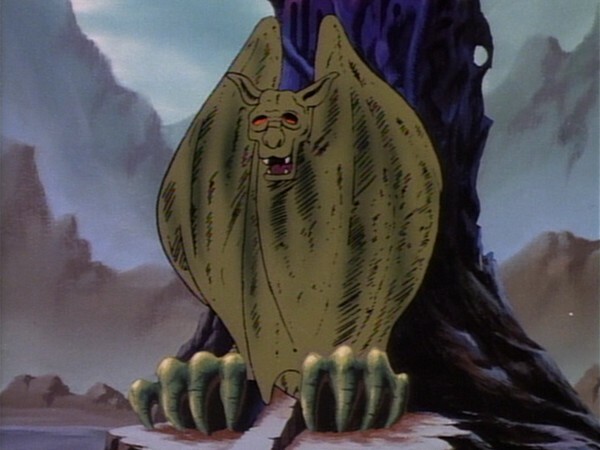 Although not named in the episode itself, the script for this episode reveals that the two-headed creature that Lion-O battles whilst crossing the Bridge of Slime is actually the Gaw-Rak-Rak making its second appearance (the first having been in “Lion-O’s Anointment Second Day: The Trial of Speed”)! This episode marks one of the only occasions where we see Castle Plun-Darr with its stone wings enfolded in a bat-like stance. Later on they are shown to unfold, revealing the Castle in its standard pose. This adds a sense of drama to the departure of the Mutant vehicles, particularly Vultureman’s Thundranium Cannon. Interestingly, because of this sequence of animation, this is also one of the only occasions where Castle Plun-Darr would have been a painted cel rather than a painted background. A unique animation error, seen when Lion-O falls into the Pit of the Netherwitch, shows the ThunderCat insignia on Lion-O’s belt with the colors reversed—a red ThunderCat symbol against a black background. The same coloring error appears again later, when Lion-O, Jaga and Brodo first escape from the Astral Prison, only this time it is the logo on Jaga’s costume that displays the reversed colors! 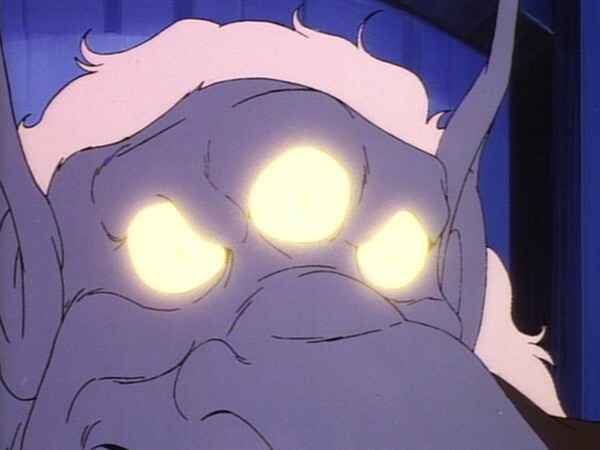 When introducing the Astral Moat Monster, the original script for this episode refers the animators to a sketch from LJN, the company responsible for the ThunderCats toyline. This would indicate that the character and design of the Astral Moat Monster originated from the toy company, rather than the toy company producing the figure based on the Moat Monster’s appearance in this episode. This is the only time in the series that the solid form of Jaga is seen alongside the adult Lion-O. Interestingly, in the original script for this episode, throughout his time in the Astral World, Lion-O was originally planned to be shown in a more ghostly form, in keeping with the original concept for the character of Nemex. Indeed, when Lion-O is in the Astral World, the script at times even refers to him as “the Spirit of Lion-O”! Even though Nemex shouts for his guards, Lion-O speaks of escaping the prison “before Nemex rallies his forces”, and the footsteps of guards are heard behind Lion-O, Jaga and Brodo just as they escape, no actual prison guards are ever seen. In the original script, Brodo was described as having red hair instead of white! It also reveals that the act of transporting Lion-O back to Third Earth was to cause Brodo to revert to looking like a much younger and stronger man. When this episode was adapted into book form by Random House, the story was re-titled “The Invisible Castle”.